Nanofluids violate mixing rules. / / / Thin film thermal conductivity depends on thickness / / / Memristor behavior is caused by oxygen vacancies / / / Resistance change by melting of GST films occurs in PCRAM devices / / / Claims of high efficiency in near-field heat transfer / / / Invalid thermal conductivity of thin films measured by thermoreflectance / / / Invalidity of discrete molecular dynamics simulations / / / Unphysical expanding Universe by Hubble’s redshift of galaxy light. Unphysical heat transfer results at the nanoscale may be traced back to classical physics based on phonons that assumes atoms always have heat capacity to conserve absorbed EM energy by an increase in temperature. In this regard, QM avoids unphysical results by negating the heat capacity of the atom at the nanoscale that in turn requires the absorbed EM energy to be conserved by QED induced frequency up or down conversion to non-thermal EM radiation at the TIR resonance of the nanostructure, the process called QED induced EM radiation. QM stands for quantum mechanics, EM for electromagnetic, QED for quantum electrodynamics, and TIR for total internal reflection. QED radiation conserves absorbed EM energy at the speed of light making phonons at acoustical velocities inconsequential heat carriers at the nanoscale. Depending on the photoelectric yield, the QED radiation creates electrical charge inside the nanostructure that otherwise is emitted to the surroundings. Consistent with Planck’s theory of blackbody radiation, the Einstein-Hopf relation for the harmonic oscillator gives the wavelength dispersion of photon emission from a solid at temperature. Extension of Planck’s theory to the heat capacity of the atom depending on the wavelength W of photons created inside the nanostructure by QED follows directly. At 300K, the dispersion of the average Planck energy of the atom by QM is contrasted with that by classical physics in the thumbnail. Classical physics always allows the atom to have heat capacity, but QM differs. For nanoparticles (NPs) having diameter d, QED photons are created at the TIR resonant wavelength W ~ 2d. Submicron wavelength EM radiation is produced because TIR traps the photons created by QED inside the NP surface. Unlike classical physics, QM requires the heat capacity of the atom at ambient temperature to decrease rapidly for W < 40 microns. 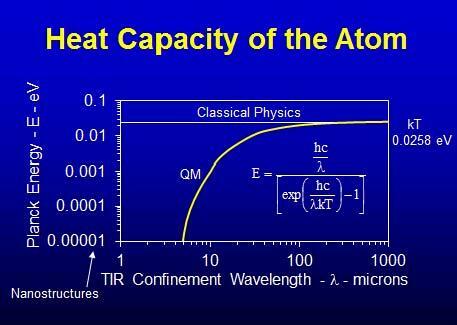 For TIR wavelengths W < 1 micron, the heat capacity of the atom vanishes. Over the past decade, the magic of NPs is thought to enhance chemical activity from dangling bonds. QED induced radiation differs in that photons beyond the UV are created under TIR confinement as absorbed EM energy (molecular collisions, Joule heat, lasers, etc.) concentrates in the NP surface because of high surface–to-volume ratios. Under TIR confinement, low frequency EM energy absorbed by the NP is therefore frequency up-converted to QED radiation beyond the UV. But QED radiation is momentary only occurring during the absorption of EM energy evidenced by the diverging UV absorption spectra of NPs at wavelengths W < 200 nm. Absent a source of EM energy, NPs do not create QED radiation. Since the TIR wave function of QED photons coincides with the circumference of the NP surface, the magic of NPs is the spontaneous creation of high energy QED induced EM radiation anytime NPs absorb EM energy. What this means is Planck’s theory that requires high temperatures to create EM radiation beyond the UV may be superseded by NPs at ambient temperature provided a source of EM energy is available. Generally, the ASME Conference consisted of presentations of nanoscale research with interpretations thereof based on classical physics. In contrast, QED induced EM radiation, based on QM differs. See PPT Presentation at ASME Conference in http://www.nanoqed.org , 2012. A brief comparative summary is as follows. Extraordinary Heat Transfer at the Nanoscale Claims of radiation heat transfer in gaps that exceed Planck’s blackbody radiation by several orders of magnitude are questionable because QM precludes atoms in surfaces of nanoscale gaps from having the heat capacity to allow temperature fluctuations necessary to satisfy the fluctuation dissipation theorem. Harvesting Phonons in Energy Conversion Claims that pre-phonon atomic motions can be converted into useful purposes before they thermalize are pre-empted in nanostructures by QED induced radiation. QED photons by creating charge or by the emission of non-thermal EM radiation to the surroundings conserve absorbed EM energy well before phonons even “think” of responding. In fact, QED photons do indeed conserve absorbed EM energy before thermalization. Since QED photons have already conserved the absorbed EM energy, heat conduction does not occur at the nanoscale, and therefore reductions in thermal conductivity based on phonon scattering are meaningless. Thermal Phenomena in Electronic Nanostructures QM preludes the conservation of Joule heat by an increase in temperature thereby negating claims that melting is the mechanism by which resistance is changed in PCRAM devices. Instead, charge is created that underlies the memristor, Ovshinsky Effect, and 1/f noise. Charge cannot be created by classical physics, but rather only by QED radiation because of QM. Thermoreflectance Measurements of thermal conductivity in nanostructures by thermoreflectance (TR) based on Fourier’s law using macroscopic specific heat are questionable because QM precludes the atom from having heat capacity in thin films. Specifically, TR measurements that claim the thermal conductivity of thin films depends on thickness are unphysical because the QED radiation loss is not included in the heat balance, and if included, allows thin film conductivity to remain at bulk. Interfacial Heat Transfer TR measurement theory based on Fourier’s law contradict experimental results that show Fourier’s law is violated in TR measurement of interfacial heat transfer. Non-Equilibrium Green’s Function The non-equilibrium Green’s function (NEGF) approach in applying QM to nanostructures is reasonably well established for electron transport. However, for thermal transport the NEGF that assumes existence of a heat current (analogous to electrical current in electron transport) is questionable because QM precludes the temperature changes necessary for heat current to exist in nanostructures. Molecular Dynamics Simulations of heat transfer in discrete nanostructures by molecular dynamics (MD) that by classical physics assume the atom has heat capacity are invalid by QM. MD by QM is valid only for periodic boundary conditions. 1. The ASME Conference showed that classical physics generally produced unphysical results in the heat transfer of nanostructures. 2. Heat Transfer at the nanoscale based on QM is suggested to provide physical results. Classically, thermal EM radiation conserves heat by an increase in temperature. But at the nanoscale, temperature increases are forbidden by quantum mechanics. QED radiation explains how heat is conserved by the emission of nonthermal EM radiation.